Nothing beats a hard day at work more than a good game of billiards afterward. Whether you’re playing with a friend or practicing by yourself, it’s a great and relaxing way to cool off. With Pool Master Pro, you can enjoy your favorite round of billiards without hitting the tables or picking up a cue stick at all. With a few simple strokes of your finger, you can knock one ball after another into the pockets in rapid succession. Despite that, the game also boasts some impressive physics, seamlessly integrating the bouncing strategies that are so integral to pool. Roll up your sleeves, chalk up your stylus, and get ready to start hustling with Pool Master Pro! It is no exaggeration that Pool Master Pro is aiming for realism. It may require a different set of controls than we’re used to seeing in real life, but you’ll quickly see that they are every bit as convenient to use as any old cue stick. In the end, it’s only a small trifle compared to what the rest of the game manages to pull off with today’s technology. Use your finger or stylus to set the direction of the ball and the speed it will roll at. Highly realistic physics cause balls to roll, spin and bounce just as you would expect them to. Use the way they collide with the walls and with each other to succeed. Be as specific as you want in placing a scratched cue ball on the table. Pay attention to the dotted line to get a good reading on where your cue ball will go and how fast it will move before you shoot it. Do you have a favorite game of pool? Do you just like to pocket balls without following any particular rule set? Whatever your pool preferences are, Pool Master Pro can accommodate you. 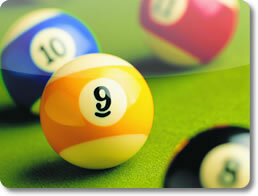 It includes a myriad of options that let you play pool just the way you like it. 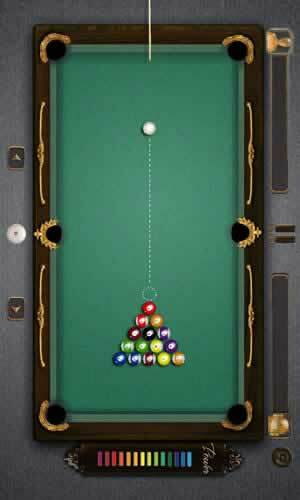 Play classic eight-ball. Pocket either the solid or striped balls while you make absolutely certain to leave the eight-ball for last. Play nine-ball. Pocket every ball you can under the caveat that you can only hit the lowest numbered one with the cue ball. Play a game with no opponent whatsoever. Practice your shots with no rules or regulations, or see how many points you can rack up before the clock winds down in Challenge Mode. Enter VS mode to play against a computer opponent. Pit your shooting skills against the AI and see who comes out on top. 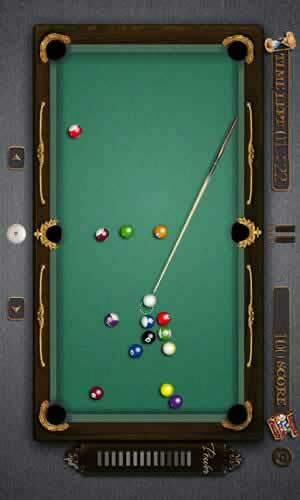 Go into Arcade mode to pocket every ball on the table using your limited number of cues. Complete over 180 challenging levels! If you enjoy billiards and own an iOS or Android-powered device, then Pool Master Pro should be an excellent addition to your library. It has everything one could ever ask for from a pool simulator. There are lifelike physics, intuitive controls, a massive quantity of challenging games, and a chance to just relax and hone your technique. Pocket Pool Master Pro and start pocketing those balls today!